Apple VP Lisa Jackson (middle) meets with Apple Developer Academy graduates and creators of iOS app Nadi. In Singapore, Apple's Swift app development courses are now offered at three new institutions, the company said in a press release. 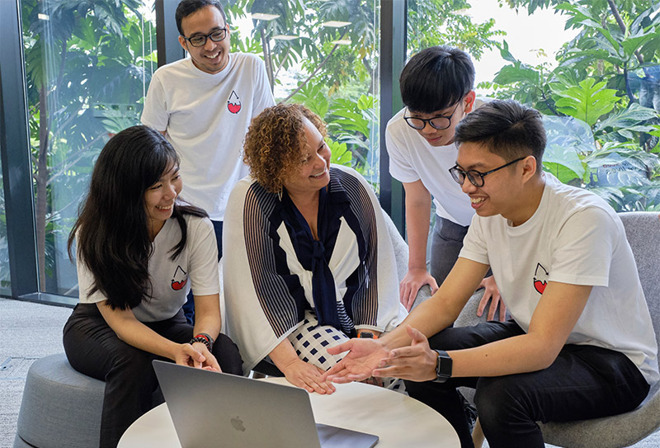 The Singapore University of Technology and Design and RMIT Online, with the support of local government agency SkillsFuture Singapore, presents adult students access to Apple's App Development with Swift curriculum. Secondary students at Pathlight School, an institution focused on students with autism, will be granted access to Apple's rubric through the Swift Accelerator program, Apple said. Adult learners interested in exploring app design and development can take advantage of a new course designed by the Singapore University of Technology and Design and SkillsFuture Singapore. RMIT Online is expanding its own iOS App Development with Swift course to students in Singapore. Both courses are designed to tap into the booming software economy. Pathlight School's program involves a 144-hour program called Swift Accelerator, which is conducted by Apple Certified Trainers, the company said. "At Apple, we believe education is one of the most powerful tools we have to make the world a better place," said Lisa Jackson, Apple VP of Environment, Policy and Social Initiatives. "We're thrilled that students of all ages in Singapore will now be able to tap into the language of coding, gaining the skills they need to grow and succeed in the app economy and beyond." In Indonesia, Jackson was recently on hand for a ceremony celebrating the inaugural graduating class of the Apple's Developer Academy in Jakarta, a facility opened in May 2018 as part of a $44 million investment in the country. Indonesia's Minister of Industry, Airlangga Hartarto, was also in attendance. Apple plans to expand its footprint in the country with the opening of a second academy in Surabaya later this year. The company noted enrollment at its Jakarta Academy has grown from 75 students in 2018 to 200 students.